A wonderful wedding! 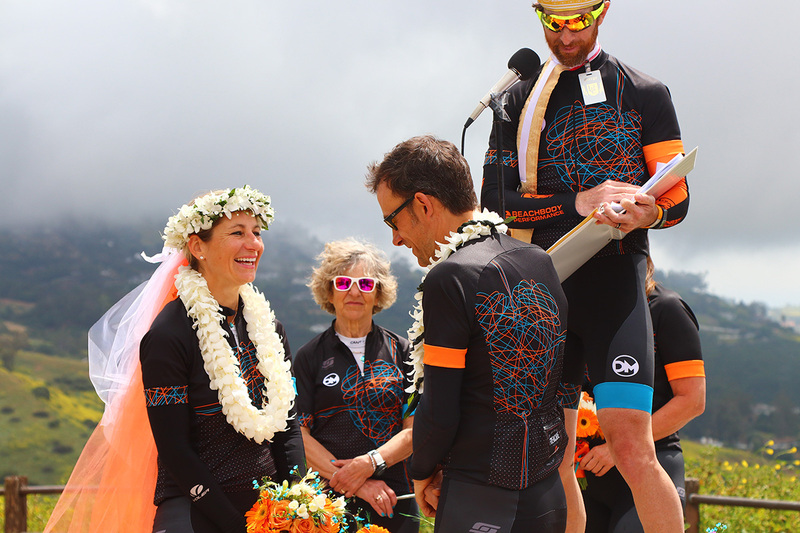 The bride (Frenchie) and groom (Happy Pants) rode their bikes to the top of a hill in their specially-designed "kits" (cycling outfits) along with about 80 of their friends for a delightful ceremony. The woman in the background is her mom. She's from France, and one heckuva cyclist - she led the gang up the hill. Very impressive! I was one of your eights... can't get more colorful than this. What a beautiful moment .. very well captured. Such a feel-good image and the title is priceless. I've decided to bump you to the top of the pile, from 7 to 10. Nice bright and sharp photo, although I'm curious why you chose this composition. The gentleman on the microphone draws my eye so seems like the subject but his head is cut off. The picture is gorgeous, just too many distracting elements for me. Proudly hosted by Sargasso Networks. Current Server Time: 04/24/2019 05:59:00 AM EDT.